When Mr. T wants iced tea (not to be confused with Ice-T) you can bet he needs three gallons fast. 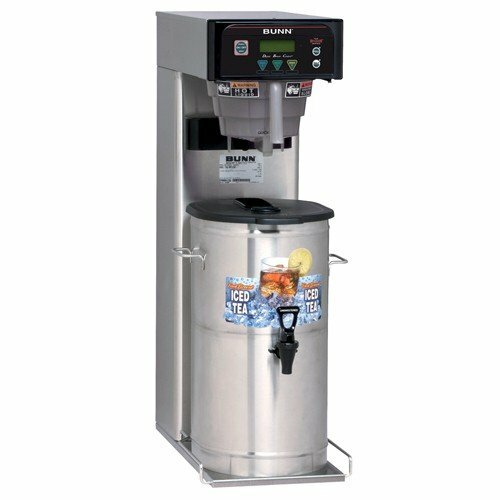 The BUNN Full Size Iced Tea Brewer is a high quality, high capacity iced tea brewer to serve your toughest and thirstiest customers. Push My Buttons: Three recipe buttons and full/half options for maximum flexibility. Custom Brewing: Digital temperature control, pre-infusion, pulse brew and cold brew lockout. Money Saver: Energy-saver mode reduces tank temperature during idle periods. Display: Advertising messages, machine status, brew counter keeps track of how many batches brewed, English and Spanish display. Compatible: Brews into all BUNN iced tea dispensers (except TDS-5).